Register Log In GliderCENTRAL Forums Regulations & Laws Possible bad chance in OH law for gliders! My husband just told me that he heard on the radio yesterday that OH is trying to pass a law next year in making all exotics illegal in the state of OH. We in OH need to see what we can do to try & keep this law from passing! I can't imagine ALL exotics. Maybe things like bears, tigers, etc. If they do try and pass a bill about exotics you need to read it carefully. They can be sneaky and try to pass it for all exotics and not just the large major breeds like lions and tigers. The wording is important. Start a petition now or if/when they try to ban all exotics? If you are able attend the meetings and be heard. I am going through this on the small scale here in Wisconsin. 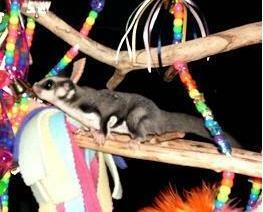 The town of Middleton is trying to pass an ordinance that as written would make owning sugar gliders illegal. I attended the second meeting tonight, it has been tabled again and will be discussed again next month. There is strength in numbers, any exotics clubs, be it reptiles, parrots, etc., get them involved. Be vigilant and don't give up until the language of the bill is appropriate. Don't let them generalize, make them spell it out in black and white what animals will be exempt, which will need permits and which will be illegal to own. some guy that comes into my work(petstore) asked something about if our store was going to be effected, but i didn't know what he was talking about. Pm me if you want to be proactive. Is it possible that even if the law is passed, the gliders currently there would not be affected? "grandfathered" in as it were? So that only NEW gliders coming in would not be allowed? This is a "knee jerk reaction" to that guy that set his lions and tigers loose and then shot himself. As Feather said, get proactive and don't be afraid to take your gliders with you when ever you go talk to anyone "official". Many people don't know what gliders are. SHOW them. If you do decide to start a petition on it you can make one on www.change.org even people out of state would be able to sign it, and you could have all of the Sugar Glider community rallying against another state outlawing them. Melissa...keep me posted if you hear any updates. I have to go to Brauer's today and will ask Dawn and/or Jim if they have heard anything. Here is the law that was signed. This is mostly for te bigger preditor type animals. I still think it would be good to get something in the works just in case. Also check out USARK who is also fighting this law. It's a horrible kneejerk reaction that is banning not just tigers and bears which we can all pretty much agree that only experts should handle...but it also bans simple pet snakes like my sweet ball python that goes to the nursing homes as a therapy snake. I am lucky not to live there...but I think if this passes...we are all in trouble. The HSUS is behind this bill and they are very very powerful and just dreadful to us "exotic" owners. It's truly a scary notion that if this passes...we are next. I tried to read this pretty thoroughly. It sounds as though he is collecting evidence. Gathering up information so that he can word the actual law properly. Do three dogs, three birds, five ferrets, and two gliders qualify my house as a zoo? I'm trying to start a petition on change.org, but could use some ideas on what to title it and what to write. I'm not always great at conveying a message. I about had a heart attack seeing that! Let me know when the petition is ready, I'll sign in a heartbeat! The actual bill that is currently in committee raeds simular to the governors words. The bill would regulate LARGE and DANGERIOUS animals which are not native to Ohio. The legal defination of these animals would be and animal which is deemed dangerious or larger that 50 puonds AND is not native to the State of Ohio. Smaller animals such as Sugar Gliders and exotic birds would NOT be affected. I have been watching the bill since it's introduction in the house earlier this year following a large release of VERY DANGERIOUS tigers and bears near Dublin Ohio and the bill id aimed at stopping this type of thing from happening ever again. I will continue to watch the proposed bill and will keep things updated. If you are afraid that it will end up including suggies and someone starts a petition, I'd definitely sign. I'm from out of state, but it would upset me to see ANYONE at risk of losing their suggies - you guys have my support!